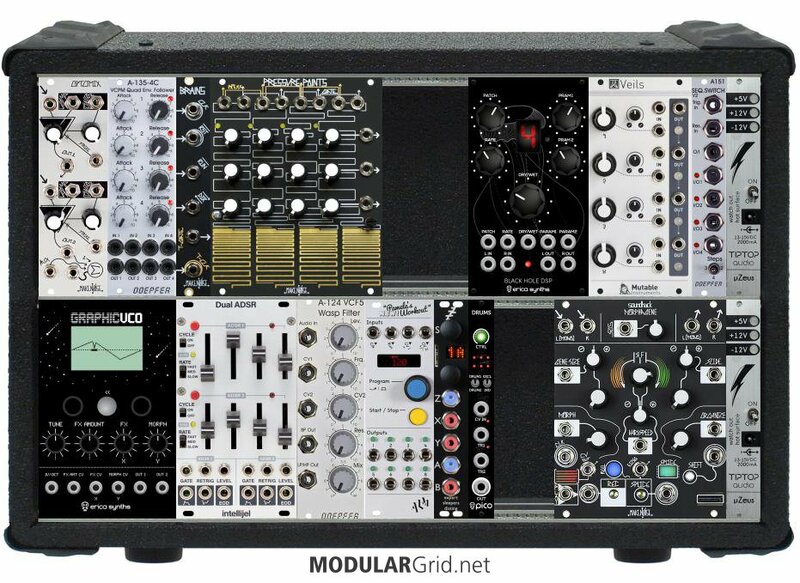 Main goal is to make a modular system who is my band mate that i can jam next to on my drumset. If the goal here is to put together a sort of generative system that you can trigger with your drumkit, I'll warn you right now: you're probably starting too small. Just the amount of trigger and microphone inputs you're going to want (need, actually) and the interactivity from those is going to pass that little cab's space limitations very rapidly. Back up, start again, this time with something like a 6U or 7U (one tile row) x 104 or larger case. Otherwise, the only way this becomes doable is with buttloads of tiny 2 , 3 and 4 hp modules, and if you want to make an adjustment to any of that while playing the drums, you'll discover a whole new level of frustration. My suggestion: go and look at some examples of the electronic kits from the beginning of that concept, such as the early Simmons kits. You'll find that these tend to be very easy to adjust on the fly because of how their control panels are laid out, basically becoming the template for what electronic controls for drummers (who tend to be QUITE busy with the actual drums themselves) evolved from. Teensy knobs and loads of patchcords doesn't lend themselves to the sort of adjustability and playability as, say, an SDS-8. It's not a bad idea...it just all has to be done right, or you'll wind up with equipment that has an unusable form factor.